Body Works Fitness & Physiotherapy is proud to be affiliated with FOOTMAXX. At Body Works Fitness & Physiotherapy, a person's gait (walking pattern) is analyzed using an advanced piece of equipment called the Metascan Gait Scanner. 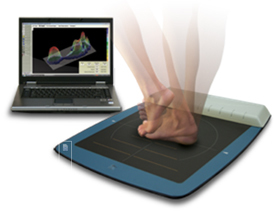 This Gait scan is the latest diagnostic tool in the field of orthotic therapy. METASCAN is a computerized system specially engineered to assess a client's foot biomechanics. It measures the distribution of force throughout a client's foot during each step, identifying high-pressure areas and gait abnormalities. The system is equipped with sensors and enough speed to accurately graph pressures exerted during the stance phase of the gait cycle. In about ten minutes, the time it takes to complete a scan, the METASCAN system helps determine problems with your foot structure which can often lead to terrible foot, hip, knee and low back pain! Body Works Fitness & Physiotherapy Custom Orthotics, gently correct your foot abnormalities over time so you can ease into the changes with no aggressive treatments. Custom Orthotics provide relief from fatigue and pain so that you can enjoy daily activities comfortably. Choose from a large variety of different customized insert choices that are discreet and are each built to meet the needs of your lifestyle! Choose from a variety of different customized men's and woman's stylish sandals, shoes, sneakers, or boots. We have well known brand names that provide you with the very best in footwear comfort, style and design! Also, Custom Orthotics are covered by most insurance companies. Orthotics are used as a preventive measure to help in restoring the natural state of your foot/feet, reducing pains occurring at the ankle, heel and sole, and other pains that are related to improper alignment of your feet. If you spend a lot of time standing or walking, you may experience pain. Without proper intervention, you may end up with an incorrect posture, or more serious pain in your knee, back and even neck. If you play sports, even the slightest imbalance that may occur in the foot may make you more prone to other types of physical stresses related to sport injuries. Overweight individuals can also put a lot of stress on various joints due to their body weight. Such individuals may find benefit from orthotics to reduce foot problems. Pain control and relief: People who suffer from foot-related problems are susceptible to experience pain and discomfort; in worst cases, even standing on the ground can give rise to pain. Orthotics are an effective, low-cost alternative to aching legs, back pain or knee pain. Foot bone alignment: It helps in maintaining proper and normal positioning of the bones that are present in the foot as well as the joints inside the ankle and knees which reaches to the hips and leads into the lower back. A lot of foot related disorders can be solved by wearing an orthotic footwear insert. Free mobility: Orthotics corrects the functionality of the foot that will allow you to walk, run and do any activity that involves your feet more efficiently. Orthotics are easy on our feet, making it easy for us to move from one place to another without any problem. Good for sports professionals: If you are an active sports player, sport activities may put a lot of pressure on your foot. Usage of orthotics cans improve your performance, endurance and strength. Outdoor games that require you to be frequently on 'your toes' like tennis, basketball, football and even athletics, require good use of orthotics so that they do not stress your feet and prevent foot-related injuries. Help older adults suffering from arthritis in relieving pain and foot fatigue: The foot has 33 joints which are susceptible to problems like osteoarthritis, rheumatoid arthritis and other painful disorders. Discomfort of the foot when aggravated can also lead to foot deformity and cause pain in the knees, lower back and shin. An orthotic shoe insert can correct foot alignments and take care of poor biomechanics on the foot, thus reducing stress on the joints. and body symmetry. Visually observe postural movement over time.